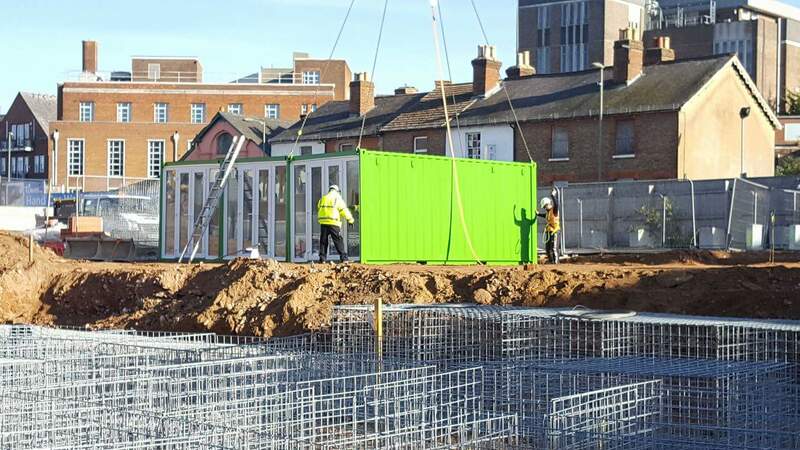 On Wednesday 2nd November the first of over 40 shipping containers were delivered as part of the construction of Guildfords first Pop Up Village. Each of the units at 20′ long and are pre prepared with insulation, electrics, lighting and heating. Five of the containers are also set up for being used as food and drink units. One of the units has also been reserved as a dressing room for acts performing in the event area of the village. Situated on Commercial Road opposite the Friary Shopping Centre it is a great opportunity for a range of start up businesses as well as an extension to existing local businesses proposition.